Try These Dietitian-Approved Healthy Salads! 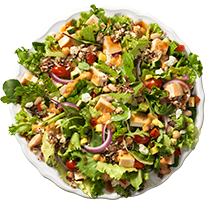 Yes–this is a Fast Food Salad–Power Mediterranean Salad from Wendy’s! What’s to Love: It’s protein packed to keep you going until breakfast and this healthy salad is also a good value. Super Ingredients: Sun-dried tomato quinoa blend, hummus and feta cheese sound like inspiration in a bowl! Make it Better: Skip the croutons to save almost 100 mg of sodium. Go easy on the dressing to save on more sodium. What’s to Love: Chipotle lime dressing gives it a nice kick! Make it Better: How to make any healthy salad even better? Ask for dressing on the side to cut the sodium even more. Make it vegetarian by skipping the chicken and adding more beans. 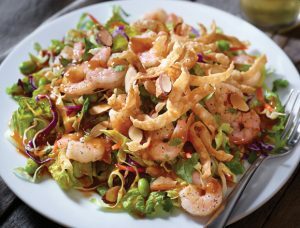 Applebee’s Thai Shrimp Salad is a healthy restaurant main dish salad. Make it Better: Go easy on the dressing to cut fat and sodium. Add a glass of milk to round out the meal. What’s to Love: Lowest in sodium–only 280 mg! Make it Healthier: Most of the carbs probably come from the dressing–fat-free poppyseed, which is usually sweet. Go easy on the dressing and add some whole grain bread for healthier carbs. Want to be even more inspired to make your own entree salads at home? Check out my previous post Main Dish Salads for Super–Deconstructed. *Sodium–you’ll find large amounts in most all restaurant foods with few exceptions. (Like the Strawberry Poppyseed & Chicken Salad above.) Less than 1,000 mg is a moderate goal to shoot for–you can make that number go down a lot by asking for dressing on the side, and adding it sparingly. Other high sodium extras include croutons, wonton strips, salted nuts and tortilla strips. « Main Dish Salads For Supper–Deconstructed!